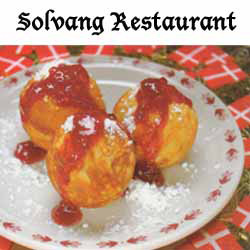 Serving Solvang's famous Aebleskiver all day long, Solvang Restaurant is home to this unique Danish treat as well as Danish and American dishes. From Danish Sausage, Danish Meatballs, Open Face Sandwich Plate to Burgers, Reubens, soups and salads, Clubs and Veggie sandwiches. Also available for sale is all you need to make Aebleskiver at home, Pans, Mix and Jam.